Planning the menu for New Years Eve celebration is the ultimate fantasy trip. The door is closing on the soon to be illicit chocolate fling – soon the same door will open, letting the new years resolutions in . There’s something Cinderella-like about the whole event. Eat what you desire now, devour the decadence, be wickedly sinful before reality bites … when the clock strikes twelve, it’s you and pumpkin! I cannot imagine a more wickedly sinful chocolate indulgence to exit 2014 than a moist darkest, black as night chocolate cake, smothered with a velvety, shiny Shiraz glaze. 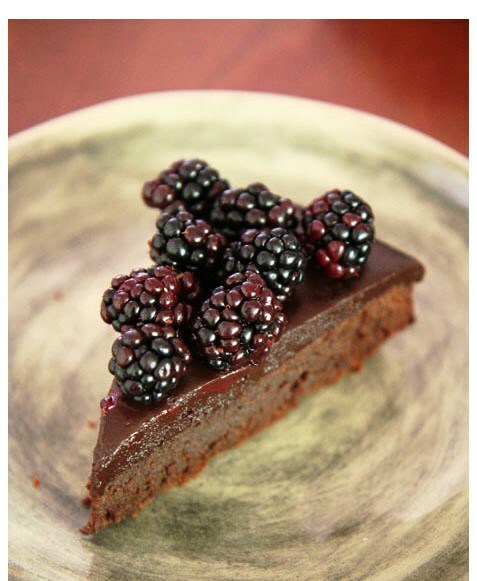 Topped with the blackest, shiniest blackberry bling, few cakes promise a more magical closure on the year that was, and go as well with champagne to welcome the New Year. Last fling before the New years Resolutions kick in. Preheat oven to 165 C. Grease a 23 cm springform cake pan with butter and dust bottom and sides with flour. Place chocolate, sugar and butter in a bowl over a saucepan with lightly simmering water (the bowl should not touch the water). Stir till most of the chocolate has melted (about 3 minutes), then remove from the heat and stir till fully melted. Set aside to cool completely. With an electric beater on medium speed, add the eggs one by one, whisking well to incorporate fully before adding the following egg. Once all the eggs have been added, continue beating till the mixture is mousse-like. At a slower speed beat in the salt and flour without over mixing. Pour batter in prepared cake pan. Bake till the top feels firm to the touch and the edges start to darken, 55 – 60 minutes. Place the cake pan on cooling rack. Leave to cool in the pan before turning out. Put chocolate, butter and salt in a bowl and melt over saucepan with lightly simmering water. Stir till fully melted, then stir in the sugar. In the mean time heat the wine in a small saucepan but do not boil. Remove chocolate mixture from the stove and whisk in the wine. Set the mixture aside for a few minutes to thicken. Place cooled cake on a cooling rack over a tray or oven rack to catch glaze dripping from the cake. Spread the glaze over the top of the cake, allowing it to just drip down the sides ever so slightly. If the glaze is to thick, add a few more drops of wine. Let the cake stand for 2 hours for the shiny glaze to set. 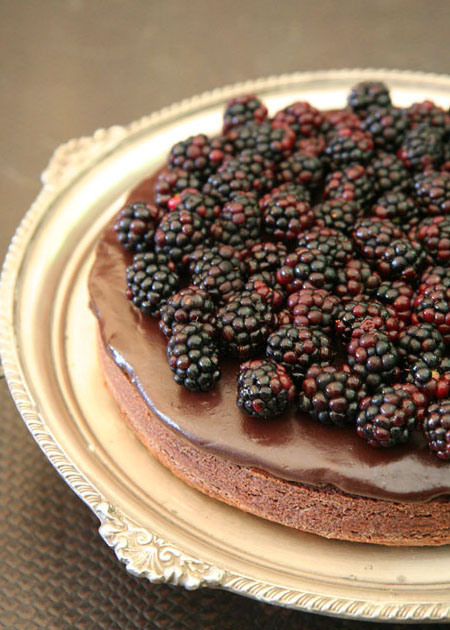 Decorate with berries just before serving. Note: The cake can be refrigerated for 2 days, but should be eaten at room temperature. Errieda Du Toit is a food writer, presenter of a cooking programme on RSG, content producer for the food series Kokkedoor and upcoming Koekedoor on Kyknet; and publicist.